For larger scale projects that demand a bigger string section or full orchestra, a conductor can help to effectively co-ordinate the instruments and ensure an efficient use of studio time. With careful study of the score, a orchestral conductor can bring out the more expressive qualities in the music and enhance the dramatic effect of an ensemble. As well as playing the violin, composing and arranging, David is a professional freelance conductor with plenty of experience in the commercial studio environment. 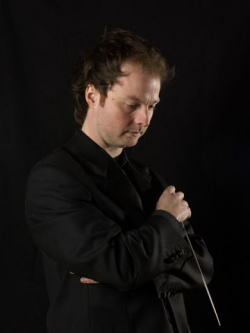 After graduating from the Royal College of Music, he studied at the Canford Conducting Course with George Hurst and more recently with Denise Ham, Royal Academy of Music and Barry Wordsworth. David is the principle conductor of Symphonia Academica. He has conducted the BBC Concert Orchestra Strings, the Kings Chamber Orchestra and the Endellion Winds as well as commercial sessions for film, television and radio recordings. David brings a down to earth and conscientious approach to conducting, with meticulous preparation - he helps to create a relaxed and productive environment in which to record.